On a long flight you don’t wanna sit next to someone who will make your trip uncomfortable. So what if you could use your social networks to select your seatmate, based on your friends or common interests? Would that make for a better flying experience? Such a service is going to be launched next year by KLM Royal Dutch Airlines. KLM says their new social seating tool, called “meet & seat”, will work with Facebook and Linkedin, but not Twitter. The tool will be opt-in only. KLM didn’t say if both people will be required to accept a seat pairing. 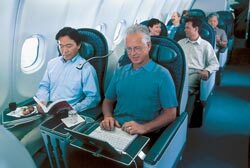 KLM isn’t the only one mixing seat selection with social networks. Earlier this year, Malaysia Airlines launched a system that allows passengers to book a flight and check-in all on the airline’s Facebook page. Passengers can also see if any Facebook friends are on their flight. Is there any part of human existence that won’t have a social media component?